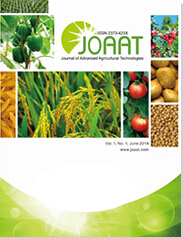 Submissions will be reviewed by the technical program committees and JOAAT editorial board, and accepted papers will be published in the Journal of Advanced Agricultural Technologies as a special issue, which will be indexed by Ulrich's Periodicals Directory, Google Scholar, Crossref, etc. Each submitted paper should be with at least 4 pages after formatting. NO charges for extra pages. Prospective authors are kindly invited to submit full text papers including results, tables, figures and references. Full text papers (.pdf, .doc) will be accepted via Microsoft submission system.